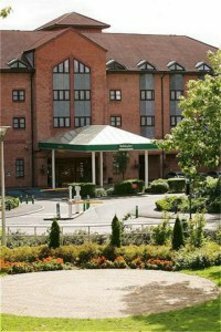 The Holiday Inn Solihull is 5 miles from the Birmingham NEC and ideally located whether you are on business or taking a break. Birmingham International Airport is 15 minutes away. Situated in the heart of England, we are 1 mile from Jct 5 off the M42 with direct links to the M6, M6 TOLL, M1 and M40.Solihull is a vibrant and welcoming town and is the perfect accompaniment to this exceptional 4 star hotel where you can celebrate your wedding venue with a picturesque view overlooking a beautiful fountain and lake. Our fantastic new facilities include 12 modern and flexible meeting rooms designed for both practicality and comfort, 120 refurbished bedrooms, air-conditioning and wireless internet access throughout the hotel, movies on demand, kids eat free and indoor heated swimming pool.Brookes restaurant and our Lounge bar offer both formal and informal dining options to suit tastes from around the world. To make the most of your stay, visit our leisure club and take advantage of the gymnasium, steam, Jacuzzi and sauna.Nearby attractions include Cadbury World, Touchwood entertainment and shopping complex, Shakespeare's birthplace Stratford upon Avon and Sea Life Birmingham. Just a few of the many places to experience when visiting beautiful Solihull.